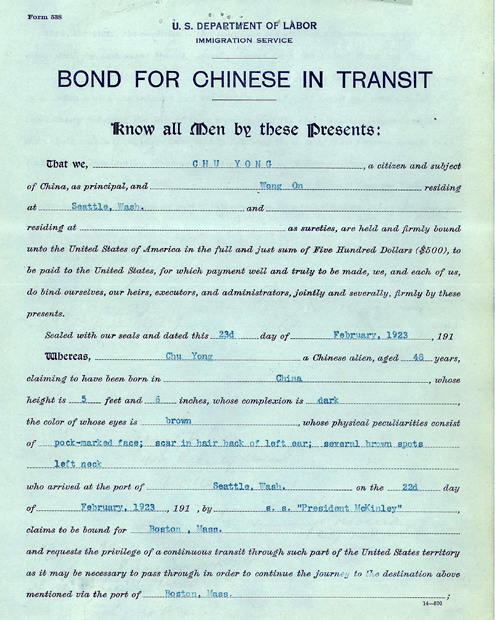 Chu Yong – Reprimand to the Seattle Office from the Bureau of Immigration, Washington, D.C.
“Bond for Chinese in Transit, Chu Yong,” 1923, Chinese Exclusion Act case files, RG 85, National Archives-Seattle, Chu Yong case file, Seattle, Box 1375, Case 41010/3/4. Chung Yong (Chu Yong), a Chinese laborer, departed for China in 1921 via Boston and was landed at Seattle on 23 February 1923. He had a $500 Transit Bond stating he would proceed across the country to Boston. Chu Yong spent more than a month visiting friends in Seattle, Chicago and New York before proceeding to Boston. In 1921 Chu Yong was 47 years old, a laundryman, living at 71 Manhattan Street, Stamford Connecticut. He was born in Har Look Village, Sun Wuey District, China. After being interrogated on 29 March 1923, the Chinese Inspector, W. P. Callahan, recommended that Chu Yong be admitted.